Nina Llopis is back and sounding great! So good to hear her voice again. This is not straight up punk but also very metal with a lot of avant-garde elements. Steve Rowe plays bass on the last track. Well I received an email from Roxx on 11-Jan-2018 announcing the pre-order for the upcoming release of the EP, but I see it's already officially out on Bandcamp Will definitely pick this up. Personally I favour digital nowadays, typically FLAC > CD > MP3, although I may grab a physical disc for a favourite band. As it happens I own two copies of Burn This Record on CD because years ago I forgot I already had it. One is a US pressing and one a UK, both appear on eBay listed as original Rex pressings. I’ll be picking this one up when the cd is available. I’m not a fan of digital downloads. I've already pre-ordered the CD and the vinyl. stevegarveyfan wrote: I've already pre-ordered the CD and the vinyl. 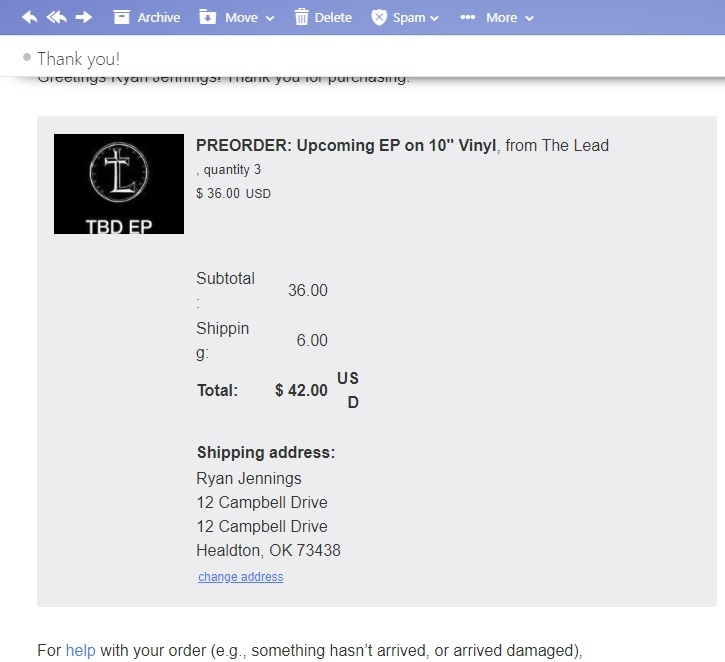 I pre-ordered the vinyl directly from the band. It hasn't been pressed yet, to my knowledge. But once it has been pressed, OH BOY! I've been on their email list for a couple years and save all my emails. I cannot find this mysterious vinyl that you pre-ordered. Bummer. I ordered 3 copies of the upcoming 10" vinyl. Here is my email confirmation from November 3. Thanks! I just emailed Julio to ask him where I can order. New Creation wrote: Thanks! I just emailed Julio to ask him where I can order. Welcome! I'm looking forward to it. He replied that they closed preorders and might reopen them soon. New Creation wrote: He replied that they closed preorders and might reopen them soon. Yo, you look like Eric Clayton! Definitely different, I like the fact that hey are very unique. Not really my cup of tea but I respect this effort. Yes, have to respect that they progressed their sound. The middle two songs are more forgettable or just not my thing, but I really enjoy the first and final songs where Nina is singing, not for that, but they are melodic and catchy.